In 2011 there were 168 linacs nationally. 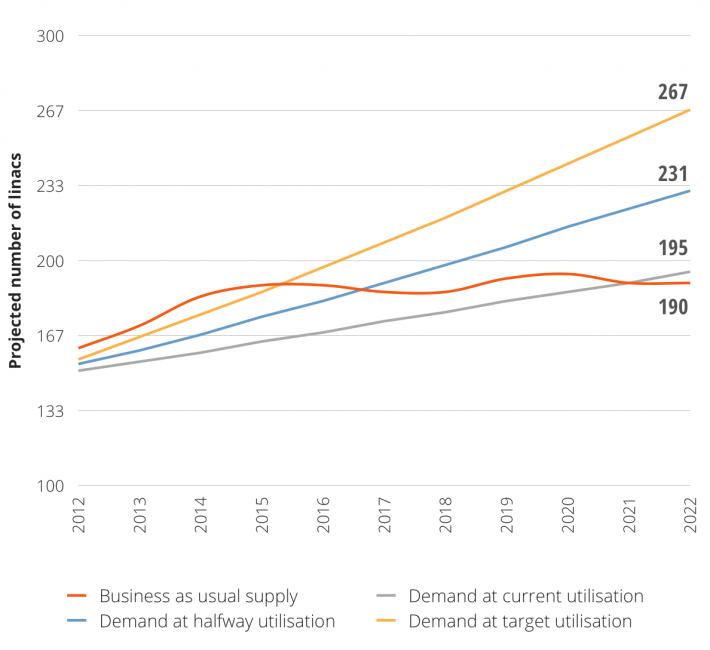 At current utilisation and throughput levels, the gap between the availability of, and requirements for, linear accelerators would be 5 nationally in 2022. The table below summarises the workforce and linac requirements for reaching target utilisation of radiotherapy. The number of linacs needed in the table below does not take into account machine retirements. 2011 numbers of workforce and linacs, compared to projected requirements to meet target utilisation rate. The number of linacs that will be available and the number that will be required over the years 2012 to 2022 was projected. Each year of projections of the number of linacs that will be available adds the average number of linacs installed per year over the last five years, and removes those that should be retired. The 2011 data on existing linacs was broken down into year of installation. Projections are further based on the number of linacs required to service patients, which are calculated based on the industry accepted average number of courses of treatment (414) each linac can accommodate per year. It is acknowledged that linac throughput can vary based on the case mix of patients and service-related factors. The useful life of a linac was assumed to be 10 years. maintenance of current under-utilisation rate 38.1%. The first year of projections (2012) removes all linacs in the current stock that was installed in 2002 or prior (15 % of current stock), as it is assumed they will not be in service in the projected period. In the subsequent years, the linacs that were installed in the year that was 10 years prior are removed from the projections. The average number of linac installations per year, over the years 2007 to 2011 years, was calculated. Each year of projections adds this number to the previous year’s stock.